995D+ is the latest model produced by Yihua The new button layout and menu makes it extremely easy to use. 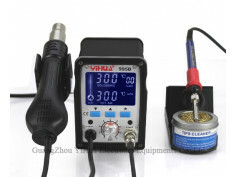 It has all good features of 995D like: large LCD screen, sleep mode (saves your soldering tip), digital calibration, Fahrenheit / Celsius scales , super accurate temperature stability. But in addition it also features three separate channels for quick temperature or air flow changes. 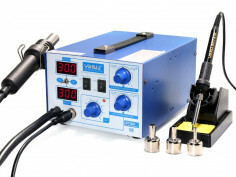 Especially useful choosing preheating and final temperature while soldering with hot air or just soldering different types of components. It also has a cool air feature and a wider soldering iron temperature range. High contrast white character LCD screen specially made for BaumTronics and not dull blue characters as sold by other sellers. Easy to use operation mode, more sophisticated settings can be adjusted in menu mode. 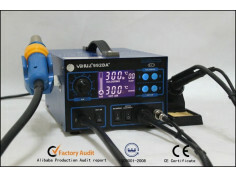 It adopts PID precision temperature control algorithm, the temperature fluctuation range of ≤ ± 1 °C. Fahrenheit / Celsius temperature conversion functions. The air gun has automatic detection, protection, alarm function, and more comprehensive protection for product safety and reliability. 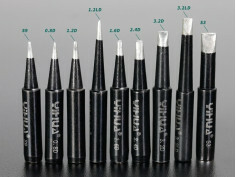 Included in the box: main unit with power cord, soldering iron with holder and sponge and one 900M-T type tip installed. Hot air handle with four different size nozzles, manual. I bought this as my first solder station for DIY electronics. So far it's been very good although I can only compare to my previous 10$ solder iron. The difference between them is like night and day. My joints are now looking very healthy. I have used the hot air only to melt hot glue but I'm looking forward to build my first SMD projects with it. Pourquoi le support de fer est-il celui du 995D et non pas celui du 995D+ (sur les photos) ? Good price, very fast shipping and good quality! Recommended. A received today the product. All it's OK. Only powered the YIHUA 995D+ rework Station, result functionally seems to be OK.
Ho notato che sono state riviste alcune cose tipo il connettore dell'aria e la base di appoggio del saldatore... se oggi ne ordino una quale mi arriverà, la nuova o quella della foto? 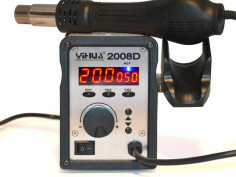 Reply from Baumtronics: Yes this is the upgraded version with iproved soldering iron and holder design. (just like images). Cette station de soudure est rapide, précise et très bien régulée. J'ai reçu ma commande très rapidement en quelques jours. L'équipe de BAUM TRONICS a été une nouvelle fois parfaite. Merci. Tundub igati okey aparaat olevat..
Vb ainukesena ,et ON/OFF lüliti asub seadme tagu küljel.. I have been used it over a year. 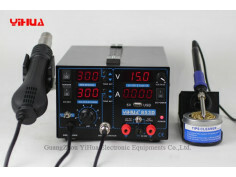 Very good and reliable soldering station.Hot air gun is very quiet (compared to my old unit witch has a membrane pump). Only minus is a power switch. Some bad people design it to back side. 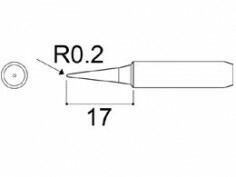 Reply from BaumTronics: Hi, usually all 75W irons have 90M-T-B tip included. 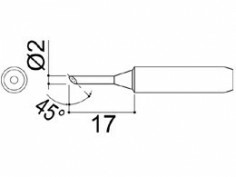 Air nozzles are round 5mm, 8mm, 10mm, and square 13mm. Toodega rahul. Kiire ja kvaliteetne teenindus. Soovitan. Masin on super ja teenindus kiire ja korralik. Very fast shipping. Good product, works well. Reply from Baumtronics: Hi yes we are expecting a small bach around 12 July. We'll also restock some tips and accessories. I want to buy the 995D+, when will the be back in stock? Hi, Just new stock arrived! The best 2 in 1 station at this price. 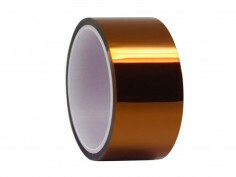 Fast and constant heating, very good air-flow, all metallic parts are earthed and easy to use. Excelent customer care, good communication, thanks Tarmo. 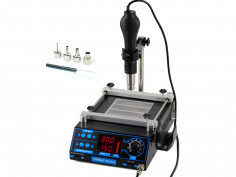 I was well prepared for this ordering a soldering station that the quality may not be very convincing, but when I got to see it I was really surprised at how great it was and really high-quality finish on all sides. 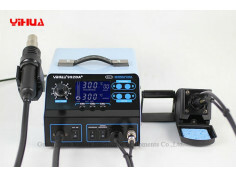 The use of soldering station confirmed my idea that I had already found on the face, that is, the device is equipped with great features which is unlikely to be many times more expensive. 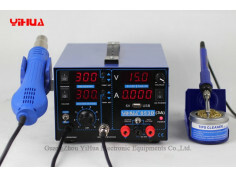 I highly recommend this soldering station and I can be confident that the quality and characteristics of a positive surprise. Hi, I really want to buy the 995D+ from you, when will the be back in stock? Also how much to ship to the uk? Thanks!